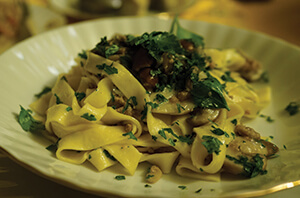 Mushroom pasta mixed with sausage mince is a hearty dish full of rich flavours and country aromas. The intensity of porcini mushrooms will take you direct to Italy and when mixed with tasty sausage and a drizzle of truffle oil, no one will be able to resist. To make the mushroom pasta, first boil the water on the stove in a large pot. Pour 5-6 tablespoons of extra virgin olive oil into a pan and warm up on a medium heat. Add 200g of sausuage mince and break into smaller pieces using a fork or wooden spoon, spreading it out to cook well on your pan. Leave to simmer for around 10 minutes or until cooked through. 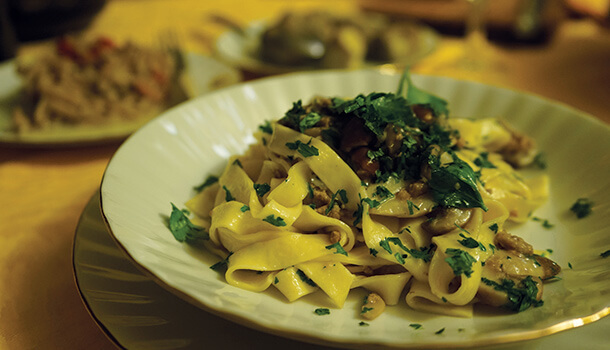 Add the key ingredients – porcini and wild mushrooms – and cook for another 7-8 minutes. Once this has cooked well and you have the DIVINE smell sifting through your kitchen, add a glass of white wine and leave to evaporate for at least another 5 minutes. Vincenzo’s Plate Tip: Although you will start to become impatient because by now the smell will be overpowering, make sure your ingredients are cooked well and the flavours nicely infused…your stomach will thank you! Add a sprinkle of salt to the mushroom pasta and mix through well using a fork or tongs. Turn the mixture down to a low heat while you cook your pasta. By now, the water should be boiling in your large pot. Add the fresh pasta and leave to cook according to the packet instructions. 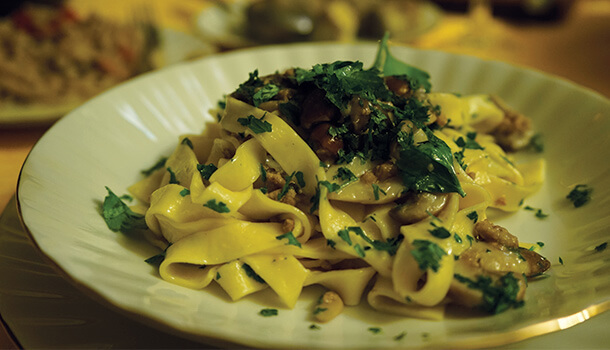 Vincenzo’s Plate Tip: Use FRESH tagliatelle pasta if you can find (or make) it. The difference is mind-blowing. Otherwise a really good quality pasta will also suit. Once cooked, strain the pasta and add it to the fry pan. Sprinkle some freshly grated parmesan cheese on top (be generous), and mix through. Repeat if you love a little extra cheese…! Immediately! Before transferring the mushroom pasta on to serving plates, add a generous sprinkle of freshly chopped parsley and mix through. It really is best savoured right off the stove!